In September 2004, then-Pres. George W. Bush declared the government-sponsored killings and humanitarian crisis in southern Sudan a “genocide,” the first time a sitting American president had made such a statement regarding an ongoing conflict. Darfur was in the news again last month, as the people of southern Sudan voted for independence, a decision accepted by Pres. Omar al-Bashir as the Ledger went to press this week. Secession would make Darfur the newest country on the African continent, and restore hope to millions affected by the events of the last two decades. Most remember the period of 2003 to 2005 as the Darfur genocide, but tensions and attacks began nearly 20 years earlier, says El-Fadel Arbab, a Darfuri survivor who will speak at The Emanuel Synagogue in West Hartford on Saturday, Feb. 19. While Khartoum-sanctioned attacks, killings, and disappearances began in southern Sudan as early as 1985, residents of the region lacked official identification documents that would allow them to leave the country. Those who tried to tell stories of the atrocities were hunted down and often executed in public, to terrorize the local population, Arbab says. Some Darfuris acquired passports by working in the capital city, and would travel outside Sudan to report on the atrocities. Language was often a barrier, Arbab says, as was fear of retaliation. In early 2003, two Darfuri rebel movements launched attacks against government military installations as part of a campaign to fight against the historic political and economic marginalization of Darfur. The Sudanese government, then engaged in tense negotiations with the Sudan People’s Liberation Movement/Army (SPLM/A) to end a three decades-long civil war between North and South Sudan, responded swiftly and viciously to extinguish the insurgency. Through coordinated military raids with government-armed militia – collectively known as the Janjaweed, “devils on horseback” – the Sudanese military specifically targeted ethnic groups from which the rebels received much of their support. More than 400 villages in southern Sudan were completely destroyed and millions of civilians were forced to flee their homes. Between 2003 and 2005, an estimated 300,000 to 400,000 people were killed, with millions displaced to refugee camps and countries throughout the world. Today, countless thousands are still missing and attacks continue. Arbab was 12 when his village, home to members of the Fur tribe, was attacked by the Sudanese Military and the Janjaweed militia, who set houses alight. He was the last of his family to escape their home, suffering multiple burns, and was left alone when his parents and siblings scattered as they fled the attack. Over the next four years, he made his way from Sudan to a refugee camp in Egypt before eventually being reunited with his mother and some of his siblings. Twenty-four family members finally settled in Portland, Me., home to the largest organized Darfuri refugee community in the U.S.
Arbab is the lecturer and educator for Fur Cultural Revival (FCR) in Portland, a part of The Darfur Community Center of Maine. FCR works to bring about a peaceful resolution to the conflict in Darfur, and promotes the health and welfare of the Darfuri refugees in the U.S. The Emanuel is a member of the Connecticut Coalition to Save Darfur. CCSD works as part of the Save Darfur Coalition to encourage the U.S. government to help protect the 2.7 million people displaced by the genocide. 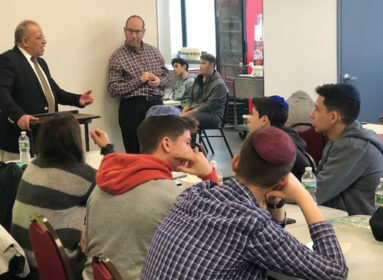 The coalition is also working with the Connecticut Teach Against Genocide (CT-TAG) effort to pass legislation mandating genocide education in the social-studies curricula of Connecticut secondary schools. In December 2009, Arbab spoke at “Light on Sudan on the Shortest Day,” a CCSD event in Hartford intended to raise awareness about the ongoing humanitarian crisis. “After the Holocaust happened, world leaders promised ‘Never again,'” Arbab says. “Since the Holocaust occurred, more genocides have taken place. World leaders must work together to stop genocides from occurring. What I have seen is enough; I do not want to see other people suffer the way my tribe, my community, my family and I have suffered. El-Fadel Arbab will speak at The Emanuel Synagogue, 160 Mohegan Drive, West Hartford, on Saturday, Feb. 19 during Shabbat services and after kiddush. For more information: (860) 236-1275 | For more information on the Save Darfur Coalition: www.savedarfur.org.